Why Are Border Disputes Rocking Malaysia-Singapore Ties After Mahathir’s Return? Renewed tensions have once again raised concerns about the state of bilateral ties following the former premier’s return to office. Over the past weeks, Malaysia-Singapore relations have been rocked by renewed disputes over the air and maritime boundaries. between the two countries The issues themselves are not new and both sides are no stranger to occasional tensions due to a range of structural issues. But the renewed round of tensions have put the spotlight on the future direction of bilateral ties following the return of former Malaysian Prime Minister Mahathir Mohamad to power. As I have noted before in these pages, Malaysia and Singapore, neighboring states which were in fact unified during a brief period from 1963 to 1965 following a separation, have had a rather prickly relationship. Despite some significant improvements in ties over the past few years, old, unresolved problems, including on boundary issues, still tend to arise in ties from time to time in part due to domestic politics. 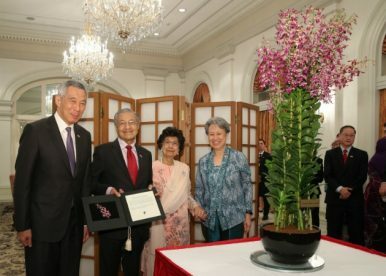 While the difficulties in ties are rooted in various structural factors as well, relations were particularly prickly during the period when Mahathir Mohamad, Malaysia’s longest serving premier who just returned to office in May, was in charge for over two decades until he finally stepped down in 2003. Though the tenure of Malaysian Prime Minister Najib Razak had seen a more stable period of ties between the two countries, his ouster and Mahathir’s return to power in May had led to concerns about whether tensions may be revived between the two sides under a new government. And while there have clearly been attempts by both sides to manage differences, tensions have nonetheless surfaced on a range of issues since Mahathir’s return, including an old water agreement and a new high-speed rail project that had been negotiated during Najib’s tenure. Viewed from that perspective, the renewed disputes over air and maritime boundaries between the two countries represent just the latest in a series of incidents that have spotlighted the revival of old tensions in the Malaysia-Singapore bilateral relationship since Mahathir’s return to power. More broadly, they reflect the challenges both sides have faced in recalibrating their ties as Malaysia transitions to a post-Najib era and Singapore also prepares for its longer-term domestic transition away from current Prime Minister Lee Hsien Loong. While the recent disputes themselves date back to October and tensions have in fact been bubbling for months now, they have escalated in the past few days with a public war of words between the two sides involving multiple statements. They surround two complex sets of issues. On the maritime side, Malaysia’s announcement of extensions of the limits of the port of Johor Bahru back in October, which it said was within its rights, has been rejected by Singapore which has said that it extends beyond previous claims. Both sides have also subsequently said that vessels have encroached into contested areas even as the disagreement continues. And with respect to air boundaries, Malaysia has protested the publication of Instrument Landing System (ILS) procedures for Seletar Airport, citing impacts on businesses and residents in Johor, and has said that it intends to negotiate the retaking of airspace over southern Johor. In response, Singapore has said that the ILS publication was in fact discussed with Malaysian officials dating back to last year, even before the new government in Malaysia came to power, and that it had only recently received notification of changes in Malaysia’s position. Officials from the two countries have since made multiple comments reinforcing their positions, even as the two sides have at the same time been calling for de-escalation and have been holding discussions with each other on these issues. And while these issues have remain to be settled and the risk of further escalation or conflict remains, talks are also scheduled for future dates, including one on the port limits issue set for the second week of January. The signs so far suggest that both sides are keen to prevent further escalation and are prioritizing dialogue to address these concerns. But beyond the specifics of the issues themselves, the revival of these disputes have pointed to the ongoing difficulties both sides face in managing their bilateral relationship as they experience shifts in their domestic politics. That broader challenge will continue to loom for the two countries and their leaderships for the months and years that follow. Malaysia Reveals New Maritime Base Near Disputed Island With SingaporeMalaysia, Singapore to Ink New Pact on High-Speed Rail ProjectWhat Did the 9th Malaysia-Singapore Leaders Retreat Achieve?What Does the Pause in Singapore-Malaysia Airspace Tensions Mean?What’s in the New Malaysia-Singapore Maritime Dispute Freeze?